This blog is not only about cooking & recipe, but it's about my recipe towards life. 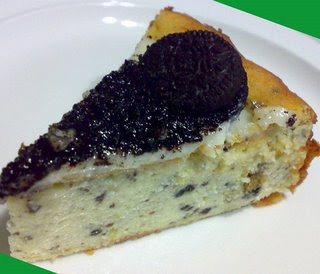 My niece that wanted to bake the New York CheeseCake, thus I improvise the recipe by added Oreo cookies. Oreo Crush are added into the cake and with some help from my niece it's decorate with more Oreo Cookies. My mum is into healthy living recently after her Chang Mai detox program. They have learn to have fruits before meal. Thus one day she bought a whole bunch of Plantain Banana for us. I have yogurt cream cheese with jam and banana for breakfast. Soon all the banana turn too ripe that I've decided to bake Banana Cake since plantain banana is best used for baking. This banana has a firm texture and a mild flavor, similar to a squash, the flesh of this banana contains less sugar but more starch than other varieties. Preheat oven to 160 degrees Celsius fan-forced. If you don't have a fan-forced oven, preheat the oven to 180 degrees Celsius. Grease and line a 22cm diameter springform pan. Leave cake to cool on a wire rack. Spread cooled cake with cream cheese icing. Store cake in an airtight container in the refrigerator. Beat cream cheese and butter with an electric mixer until creamy. Add sifted icing sugar and beat until smooth. Add lemon juice and beat to combine. Spread icing over top and sides of cooled cake. Wats next after yogurt? I decide to search the internet for making cream cheese. EASY! 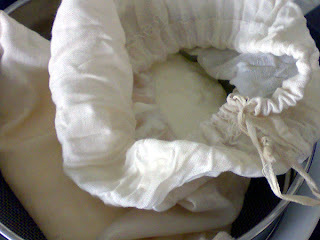 Just place the yogurt into a cloth over a strainer and leave in in the fridge overnight to drain off the liquid. Walla! You have cream cheese! 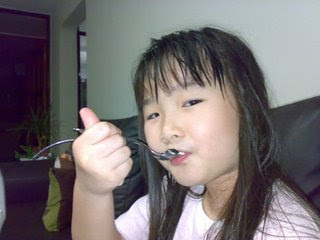 However, the taste is like yogurt and only the texture is like cream cheese. Mmhhh.. Anyone can share with me how to make a good homemade cream cheese? Baking Soda, well known as bicarbonate soda. It is a alkaline compound , usually sodium bicarbonate. It neutralise acids in dough or batter. This encourage batter to rise in the oven. The bi-products of this reaction are water and carbon dioxide. It is usually used along with baking powder in cakes with acidic ingredient like sour cream, honey, molasses, fruit and buttermilk. It also encourage browning. Cream of Tartar is an acidic salt, potassium bitartrate. 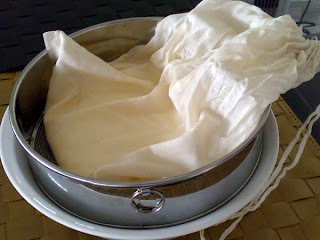 It's role is to stabilise beaten egg white and improve the texture of egg-foam cakes. Baking Powder has a mixture of chemicals that react to tied carbon dioxide when liquid is introduced. It consist of an acid salt, an alkali, and a filler, usually cornstarch, to absorb moisture and prevent the compounds from reacting in the jar.